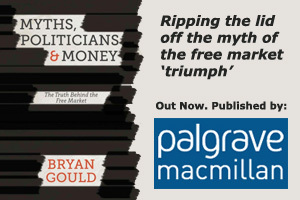 In The Democracy Sham: How Globalisation Devalues Your Vote, Bryan Gould considers the impact of the global economy on the democratic process in a number of countries, including New Zealand and Britain. He shows that international capital is, by virtue of its freedom to move at will across national boundaries, now able to dictate to democratic parties and elected governments the economic and other policies they can and cannot pursue. The result is that the political choice offered to voters has, without their realising it, been narrowed and constrained and the voice of the left has been muted and virtually extinguished. Bryan Gould explains the development of the global economy and the reasons for its current hegemony. He shows that the orthodox justifications for globalisation – that it has delivered better economic and other outcomes for both the world economy and individual countries – cannot be supported, and that it has, on the contrary, produced a global slowdown and unsustainable inequalities and instabilities on both the international and domestic scale. He looks at the political implications of what he describes as an historic shift in the balance of power between capital and labour, and at the failure of parties of the left to mount any effective resistance. He concludes by considering the steps that could and should be taken to restore balanced and sustainable economic development in the world economy and a fully democratic choice to voters in countries as diverse as New Zealand and the United Kingdom. The Democracy Sham: How Globalisation Devalues Your Vote is published by Craig Potton Publishing in September 2006. Bryan Gould was interviewed by Chris Laidlaw about The Democracy Sham on New Zealand National Radio on the morning of Sunday, 10 September. Excerpts from the interview appear below. “What I am concerned to do is to dispel the notion that the social and political and environmental downsides [of globalisation] that are becoming increasingly apparent can be offset by economic considerations…in other words, the economic story is not a good one either. National governments have found the going tough and internationally the economy has grown quite slowly since globalisation and has been marked by tremendous inequities and uncertainties and instabilities.